Creek Street – known as one the best boardwalks in the world. Formerly the Red Light District, Historic Creek Street is a short walk from the docks and a great place to visit famous Dolly’s House, view totem poles, shop at locally-owned stores and galleries, enjoy local art and culture. In the summer months thousands of salmon return and make their way up the creek. Also from the board walk you can take a tram up the mountainside to Cape Fox Lodge and restaurant for lunch or dinner with a panorama view of Ketchikan. Ketchikan’s Museum & Library – located in the same building at 629 Dock Street and near Creek Street. The Museum is a great place to see and learn more about the history, art, and culture of Ketchikan and Southeast Alaska. The Museum features permanent and ever changing temporary exhibits featuring Alaskan memorabilia, a collection of Native Alaskan artifacts, and historical photographs. Deer Mountain Tribal Hatchery & Eagle Center – a short walk from Creek Street and adjacent to the Totem Heritage. 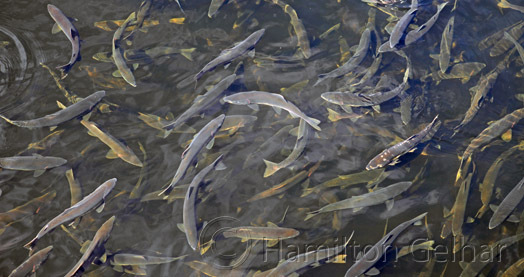 The Hatchery releases tens of thousands of coho and king salmon smolts (two-year-olds) each year. At the Hatchery visit observation platforms and educational displays concerning the salmon’s life cycle. 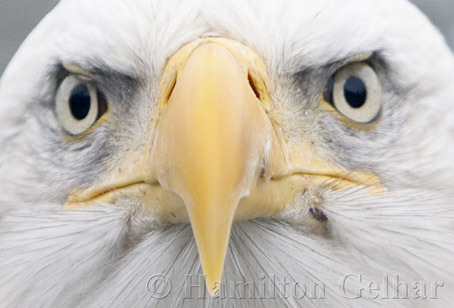 See Bald Eagles and other raptors such as Great-Horned Owls, Red-Tailed Hawks, Peregrine Falcon, and Turkey Vulture at the Eagle Center. Saxman Totem Park – approx 3 miles from Creek Street and downtown Ketchikan. Saxman Totem Park has one of the largest gatherings of totems in the world. Enter the Beaver Clan House where you are welcomed by song and dance by the Cape Fox Dance group. A great place to see World renowned Master Carvers such as Nathan Jackson work on their carving projects. 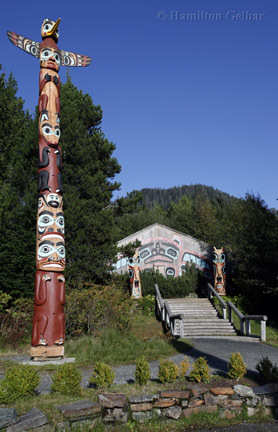 Totem Bight State Historical Park – this park is located 9.5 miles north of Creek Street and downtown Ketchikan. Totem Bight Park is home to 14 totem poles and a community house or clan house. 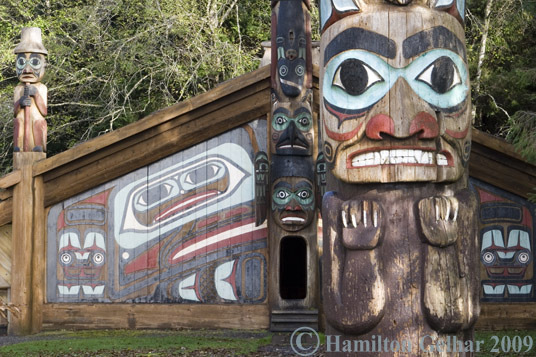 Totem Bight is pristinely located amongst tall cedar trees and on the ocean.